Formed in Ludlow, KY (A Cincinnati, OH suburb), the Flight Station’s approach to getting their music noticed has fared well. The pop/rock act was featured as one of the top unsigned bands in Alternative Press Magazine as well as being a featured artist on 97.3’s the sound FM, a commercial radio station in Cincinnati, OH. “These guys are the future. You know it not only by listening to their music, but in talking to them as well. They are so positive. Their incredible sense of pop rock sticks to your eardrums and doesn’t let go until you feel as though you may be wearing their songs out. These guys are destined for big, big things that will be coming to them very soon,” says Kevin Michael of 97.3’s the sound FM. The Flight Station, is gearing up for their latest EP release, on Arcatek/Crushtone Music ,entitled Prepare For Impact , which was produced and recorded by Jim Wirt (Hoobastank, Jacks Mannequin, Fiona Apple, Incubus, etc.). The group members began playing music during their sophomore year in High School. Corey Moore (Lead Vocals/Guitar) and Corey Powell (Drums) started jamming in their parents’ basements and one day invited Alex Wheatley (Backing Vocals/Guitar) over to hang out. “Before that day I’d never played an instrument. After that day, I couldn’t stop”, says Alex. At this point the band began writing music and experimenting with different styles, and then Corey Moore pulled out a song he wrote at age fifteen called Stay with Me Tonight, which is featured on their first EP Falling Star. Stay with Me Tonight was the song that shaped the bands pop/rock musical direction and soon after Josh Roaden (Bass) joined the band to complete the line-up. 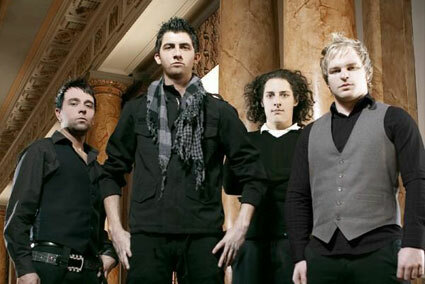 From the band’s humble beginnings of playing high school birthday parties to playing shows with highly notable artist like The Ting Tings, SafetySuit, Copeland, We shot the Moon, Secondhand Serenade, The Shiny Toy guns and more, the Flight Station has also had many other accomplishments as a band, such as having their song California featured on an episode of The Real World Hollywood, becoming a featured artist on purevolume.com and being nominated for Rock Artist of the Year in the Cincinnati City Beat newspaper. The Flight Station has taken many of the musical influences they grew up listening to and morphed them into the modern style of music today. The band’s wide range of music on their IPods will tell you a great deal about them. From Pearl Jam to the Everly Brothers to Jimmy Eat World, the Flight Station gives listeners a little bit of everything. “The Flight Stations’ emanate optimism and blend of a wide range of influences, into their sway-ready, melodic rock,” says Alternative Press Magazine (January 2009). The Flight Station will be announcing up coming tour dates this year, so keep a look out for these guys and check back often at www.theflightstationmusic.com or www.myspace.com/theflightstation.